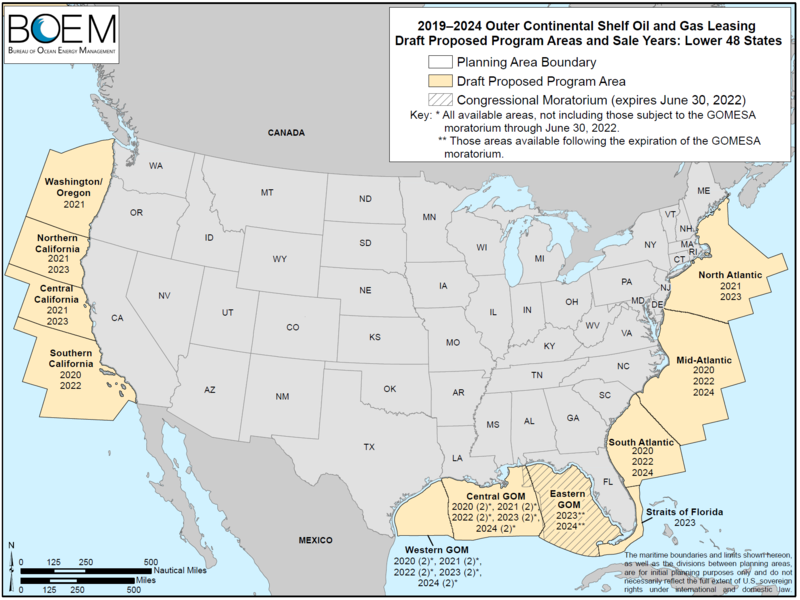 What is the National Outer Continental Shelf Oil and Gas Leasing Program and how will it affect you? This represents the first in a series of blogs developed by the American Littoral Society, meant to help empower our members and fellow citizens of the coast to stand up in opposition of the recent proposal made by Secretary of the Interior Ryan Zinke for the 2019-2024 National Outer Continental Shelf Oil and Gas Leasing Program. Looking for a quick way to engage? Sign our petition to Secretary Zinke opposing new offshore drilling along the U.S. coastline. On January 4, U.S. Secretary of the Interior Ryan Zinke announced a new proposal for the 2019-2024 National Outer Continental Shelf Oil and Gas Leasing Program (National OCS Program), calling for the largest sell-off of offshore oil and gas in U.S. history. This post outlines the next steps in this proposal process, dives deeper into what is proposed, and analyzes the potential impacts on our ocean and coasts, as well as the coastal communities that rely on them for jobs and money. If put into action, the National OCS Program would effectively open more than 90 percent of U.S. offshore waters to oil and gas exploration, and would determine the timing, size, and location of offshore oil and gas leases. This new proposal is in stark contrast with the program put in place by the Obama administration, which, after over a year of stakeholder engagement around the country, now protects the Pacific and Atlantic Coasts, part of the Arctic, and 94 percent of the Outer Continental Shelf from oil and gas exploration and extraction. The draft National OCS Program includes 47 potential lease sales in 25 of the 26 planning areas, including 19 sales off the coast of Alaska, seven in the Pacific Region, 12 in the Gulf of Mexico, and nine in the Atlantic Region. This is the largest number of lease sales ever proposed for the National OCS Program’s five-year lease schedule. Oil companies would be able to drill in new areas of the Arctic Ocean, the Gulf Coast and, for the first time in more than 30 years, the Pacific and Atlantic coasts. From the harmful impacts of seismic airgun blasting on local fisheries and marine life during the exploration phase to the potential of oil spills during the drilling and extraction process, offshore drilling risks jobs, property values, public health, wildlife and the environment in and around America’s coastal communities. Moreover, it jeopardizes the national economy because tourism and industries that rely on a healthy ocean bring billions of dollars in revenue annually. Coastal communities are already on the front lines of climate change, and are slated to suffer the brunt of any oil spill on or near their beaches. All it takes is a look back in history. Time and time again we find that where we drill, we spill and every time we spill, we threaten public safety, kill wildlife, and destroy local economies that depend on a healthy ocean and coast. If the National OCS Program moves forward as is, it will pave the way for oil companies to pull more carbon out of the ground so it can be burned and further contribute to growing levels of greenhouse gases in our atmosphere - serving as a catalyst for climate change. Increasing carbon emissions will prove costly to society in coming decades by diminishing public health, disrupting agricultural productivity, and increasing flood damages and severe weather conditions. Under this “America First” energy plan, international oil conglomerates would be enriched, while our coastal environments and economies could be devastated. We are now in the 60-day public comment period for the National OCS Program, which is scheduled to close on March 9. Formal input can be provided to the Bureau of Ocean Energy Management (BOEM), which is the agency responsible for managing these leases, in two ways. First, you can submit an official comment online and second, you can attend one of 23 listening sessions hosted by BOEM. After the comments are received and environmental reviews are conducted, a revised program will be released and followed by another public comment period. The final proposed plan is expected to be completed by the end of 2018. 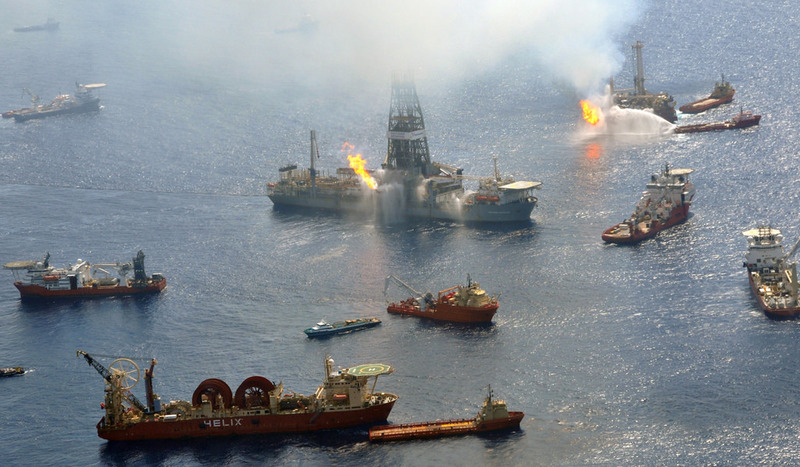 The President of the United States has the authority to withdraw any area from the five-year plan, and local public opposition to drilling has been critical to past decisions about offshore drilling. We encourage you to use the power of your voice and stand up for your ocean, coast, and community. The Healthy Oceans Coalition and American Littoral Society are committed to protecting our ocean and coasts and will continue to explore the impacts of this proposal and offer opportunities to engage in the process as it moves forward.